There have been various accidents since yesterday due to strong wind and rain. In Seochon, Chungcheong Province, a bus slid into a river and fell into the river, killing one and injuring five others. Jung Dong-yeon is reporting. The bus falls into the rivers and the firemen are rushing to rescue the wounded. There have been various accidents since yesterday (8th) due to strong rainstorms. 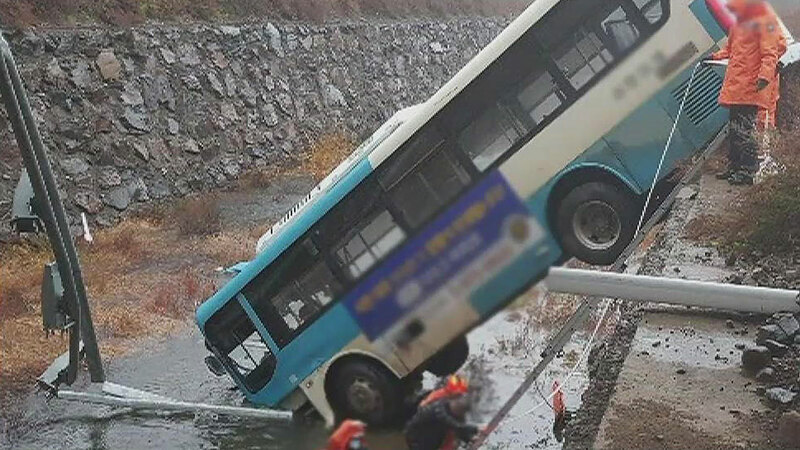 In Seochon, Chungcheong Province, a bus slid into a river and fell into the river, killing one and injuring five others. The bus falls into the rivers and the firemen are rushing to rescue the wounded. Yesterday, around 3:35 pm, a city bus that passed the bridge from Seochun Chungcheong Province fell into the river. One 81-year-old male was killed and five others were injured in the accident. The 64-year-old driver said the bus suddenly slipped into the rain. At about 6:30 pm yesterday evening, a five-ton truck slipped on the side of Yeongdeok Expressway in Cheongju. No one was injured in the accident, but the road was under control, and one kilometer behind the tanker, an eight-ton truck, and a car collided in a triple collision. Police are investigating the exact cause of the accident as a five-ton truck driver slipped off the comb. The construction site is tilted to fall. The reinforcing bars that supported the roof were bent like a peek. At 9 pm last night, a temporary steel structure collapsed in strong winds at the construction site of Busan Paik Hospital in Ganggum-dong, Busan and hit a three-story tenement house. A 78-year-old son, who was surprised by the sound of house windows being broken, was moved to the hospital. In addition, eight cars parked on the roadside were destroyed. The Busanjin-gu Office and the construction site plan to use the large crane to demolish the steel structures that fall.